Stunning vintage signed photo from the 1953 classic "Abbott & Costello Meet Captain Kidd". Signed in beautiful vintage fountain pen ink, "To Paul Lou Costello Bud Abbott". Authentic photos signed by both Bud and Lou are very scarce. HOWEVER, photos "in character" .from one of their feature films is extraordinarily Rare. As a matter of fact, I have only seen ONE other in character photo signed by them in the last 35 years collecting. This gem has been professionally authenticated by the most reputable autograph authentication service JSA and comes with their full letter of authenticity. Signatures are particularly bold and beautiful vintage blue fountain pen ink and as you can see in the image above, signed in the perfect locations! . There is a very light ink featuring to the beginning of the "L" in Lou and "B" in Bud, but doesn't detract from the beauty of the signatures. * See enlargeable images above and below. Terrific image of Lou and Bud with Charles Laughton in an original 1953 publicity photo from "Abbott & Costello Meet Captain Kidd" . Charles Laughton did not sign the photo but his signature appears on the market now and then and is not very expensive should you want to mat and frame this photo with Laughton's autograph. You will be hard pressed to find a photo like this museum grade treasure! 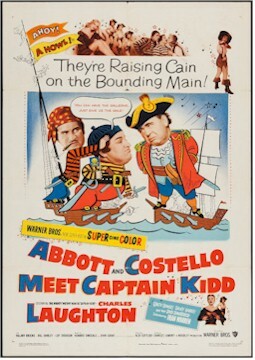 Abbott and Costello Meet Captain Kidd is a 1952 film starring the comedy team of Abbott and Costello, along with Charles Laughton, who reprised his role as the infamous pirate from the 1945 film Captain Kidd. It was the second film in SuperCinecolor, a three-color version of the two-color process Cinecolor. Abbott and Costello Meet Captain Kidd was filmed from February 27 through March 25, 1952. Since Universal would not spend the extra money to make an Abbott and Costello film in color, the duo opted to do it themselves. Using a contractual agreement with Universal that permitted them to make one independent film per year, they made the film using Abbott's company, Woodley Productions (and their first color film, Jack and the Beanstalk, using Costello's company, Exclusive Productions). Produced during a slump in Charles Laughton career, the accomplished actor signed on to do the film for a mere $25,000. Shortly after filming was completed, on April 6, Abbott and Costello hosted an episode of the Colgate Comedy Hour and brought Laughton along as a guest. Later that year, the three of them filmed a two-minute commercial for Christmas Seals.